Siders Jewelers is always the answer! Visit us today. Gemologist On-Site – Our gemologist performs many tasks in our store! Repairs – Bring in your most cherished items for repairs, and rest assured they’ll be in the hands of a professional. Remounts – Breathe new life into that gorgeous gem. Let us turn it into a whole new style! Ring Sizing – We do our own ring sizing. This results in a quick turnaround for your precious new or new-to-you jewelry. Restoration – Restoring your beautiful jewelry is a lot cheaper than replacement. We’ll have it back to looking new in no time. Let us surprise you with the results! Soldering – Don’t worry. We can solder broken pieces back together! Ear Piercing – Whether it’s your first or your next, let us pierce your ears!! 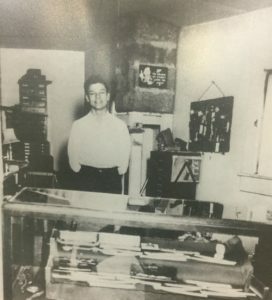 Harry Siders opened his first store in Rainelle, West Virginia in 1947 as a watch repairman. While in Rainelle, West Virginia, he met Blanche Collins. They married and moved back to his hometown. In 1961, Harry and his wife opened a retail jewelry store. Harry loved his customers, often giving them a tour of his collections, containing hundreds of clocks and watches. In 1977, his son David joined the business. David began doing gold work and studied at GIA. He received his gemologist diploma a few years later. In 2003, David and his wife Jo Anne opened a store on Main Street in Point Pleasant, WV. Our priority is taking care of our customers. We perform jewelry repair with quick in store service. Also, minor watch repairs and batteries are available. We wrap gifts to make them special for any occasion. Also in the store is the Twisted Sisters Boutique — we have fashion galore! Scarves, handbags, gloves, and more!